A day with Allen Whiting includes painting, farming and family. A human skull, a green door from the Edgartown dump, a key from a plantation house in Bequia, an old plastic plate with the name Bea written on it in faded letters, jars stuffed with paint brushes. Tom Maley’s easel, Stan Murphy’s easel, a Miami Hurricanes helmet, a bunch of wilting dahlias and about 300 paintings. 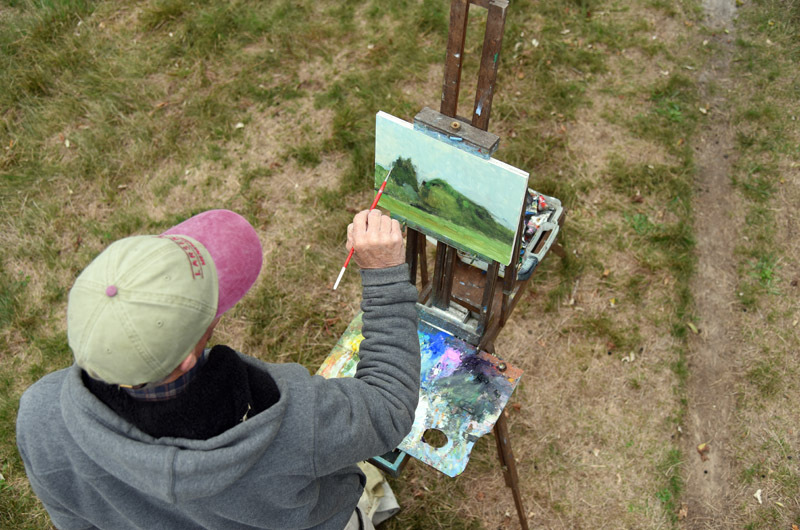 These are a just few of the things you’ll discover in Allen Whiting’s West Tisbury studio. 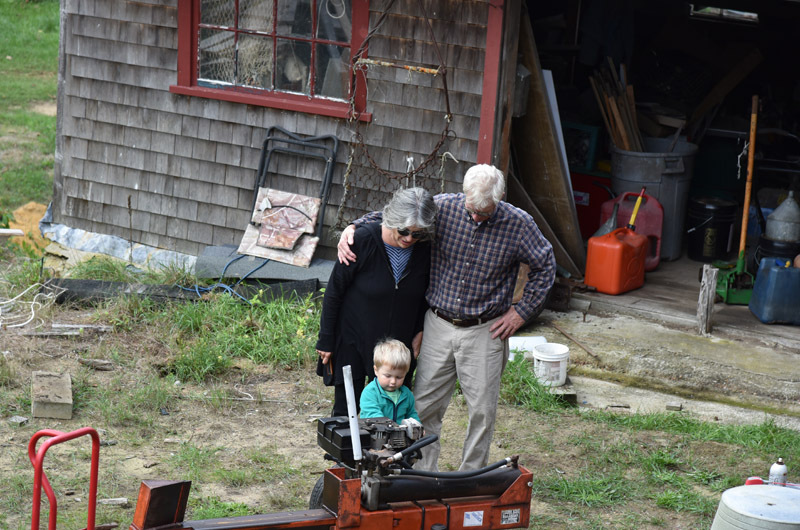 The studio itself is a patchwork, made from a piece of the old Grange Hall, part of the former West Tisbury town office and a shed roof structure that artist and friend Jay Lagemann helped Allen tack onto one side. It turns out that Allen Whiting can say a lot. First, there’s the land. 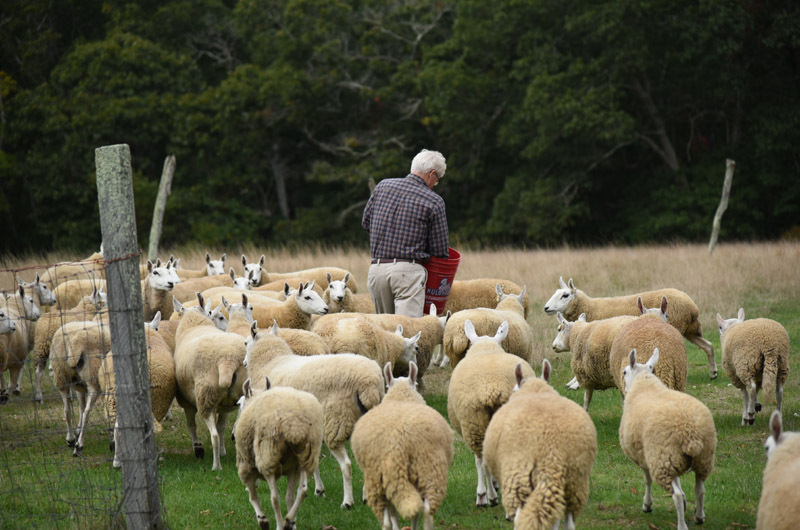 Sixty-four of his 70 years have been spent on his family farm, tucked between the Panhandle and State roads in the heart of West Tisbury. The house he lives in was built by his father’s uncle, Judge Davis, sometime in the 1870s. 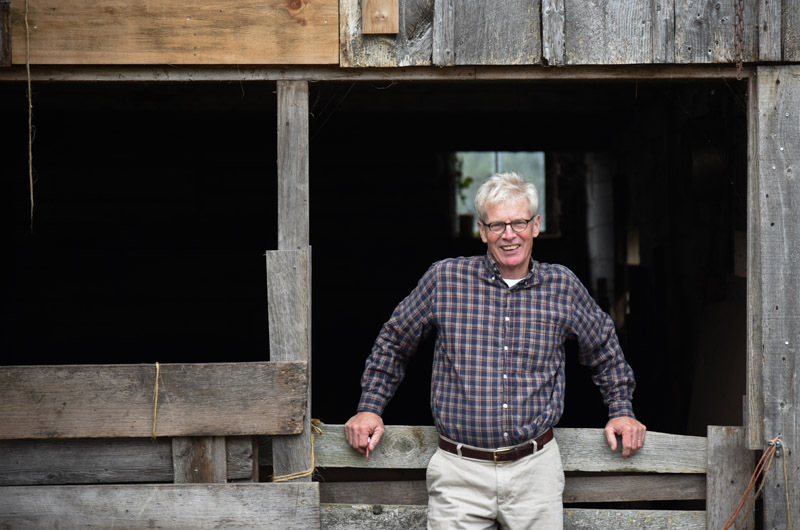 He also credits Stan Murphy, who lived just up the road from the Whiting farm — and whom he describes as “my father’s best friend and my best friend’s father” — with being a great influence. “I watched him develop. Seeing new paintings come into the house. His new images. That was my art education. I didn’t go to a museum until I was 24,” he says. After high school he went to the University of Miami to play baseball and paint. “I mean, I have no idea where I got this idea. We had no little league or baseball here on the Island. What made me think I could play baseball with these kids who grew up playing every day?” he says. “And I hadn’t really done any formal painting training. I just knew I liked it.” Later Allen returned to the Vineyard to help his father on the farm. But while he left his dreams of professional baseball down south, painting was still with him. Wearing New Balance sneakers, khakis with a few paint splatters on them and a brown plaid shirt, he heads outside to the sheep barn. In the driveway, he is greeted by his daughter Bea and her two-year-old son Asa, who calls him Papa. 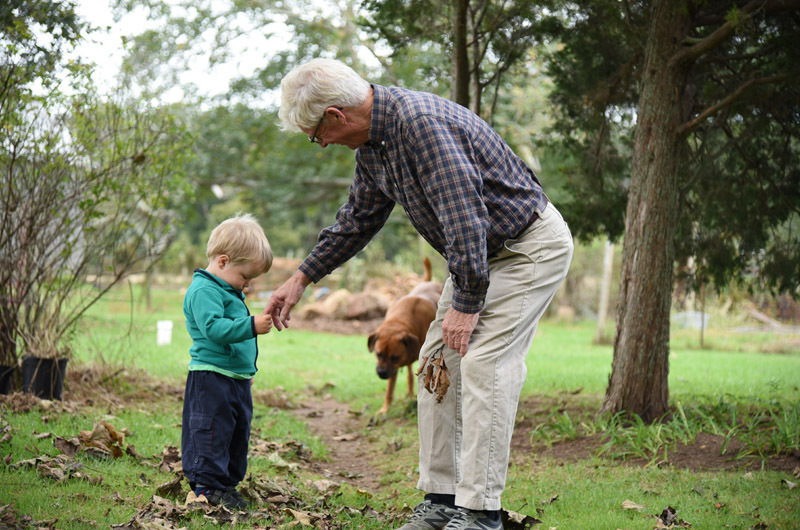 Taking Asa’s hand, they walk toward the barn. “Right now, my grandson has not figured out the value of my wife’s charms because I have the ultimate attraction: five tractors,” he says. Sheep are let out to graze; chicken coop doors are opened and Allen looks for eggs. Then he heads for the big barn, half of which was once a church. He shows the old plaster walls from the church, and the hay mow, which is not as full as usual due to the drought on the Island. “Watch your head,” he cautions. “Everything here is built for short Englishmen.” He points to the first Allen Whiting painting, small blue handprints on a door frame. He walks through the barn toward his studio, on the other side of the farmhouse. In the studio there are more piles of old stuff: a wooden duck boat, a pile of black socks, buckets of nails, chains, fencing, wrenches, an orange buoy with the name Whiting written on it, old rake heads. “This is where I make my frames. Usually in April. When it is cold and miserable,” he says. He begins to map the sky with his brush. His moves are loose and feel almost unconscious. “You know, you can’t mix blue and white and get a sky that looks like a sky,” he says. After a few more slashes of a gray-blue, he begins to lay the foundation for the field. “No one was doing landscapes in school. I did go back to school. Windham College in Vermont. I think they would have let anybody in. Anyway, I used to feel so provincial.” He pauses. The brush goes back into the turpentine, another color is mixed. He works on the new painting, talks about Benton, Picasso and Richard Diebenkorn, among others. Later he puts the palette and brushes away. “I’ll know if I like it when I look at it tomorrow,” he says. He muses about sending a few of paintings to a gallery in Santa Monica, Calif. But he would only make half what he could make selling in his own gallery. Jay Lagemann strolls into the yard. He’s just back from meetings in New York city for an installation of his work there. He describes the machinations it takes to get a sculpture installed in the city. Allen shakes his head. “Well, did you decide where you are going to sign your name?” he asks. Jay doesn’t know, but he knows he is going to have all his grandchildren sign it too. They talk some more. The sun is getting lower in the sky, the sheep have gathered in a pack in the near distance. Allen folds up his palette, puts away his brushes and packs up the easel. “It’s a red-letter day when you get a painting done,” he says. Then walks to the house to see what Lynne wants to do for dinner. Later, he’ll head to the studio to paint some more. Education: Bachelor of arts from Windham College, earlier stint at University of Miami. Parents: Everett Whiting, Jane Mayhew Whiting. Spouse: Lynne Whiting, married 38 years. Children: William Whiting, 44, Beatrice Whiting, 36, Everett Whiting, 34. Grandchildren: Asa Ruel and Prudence Ruya Whiting, both 2 years old. Animals on the Whiting farm: 50 sheep, 30 chickens, 4 pigs, 2 horses, 1 dog, Roxy (Everett’s dog), 1 cat, Georgina (Bea’s cat). What a treasure of a story....a glimpse into the magic of the Vineyard and the life of a special resident. Well penned and a simply touchinh article. It is refreshing to see another from the class of 1946 adding some soul and talent to the field besides Clinton, Letterman, Trump, and Korves. When I first touched the island in my 20's, I yearned to capture the oldness of the land, the air that was of the sea, the trees that were wrapping themselves in the blues, greys, and clouds. I had never seen "that light" that appears suddenly in late August and sharpens not only the shadows; but your eyes, each breath, and your soul. It is that joy of now and being alive and a part of this earth that I yearn for and search to feel each time I get back on-island. It is this patient search that Allen Whiting grasps for in each painting that takes one's breath away. It reminds me of when I had my nose inches away from an Andrew Wyeth painting, marveling at its realness and realizing that he was an impressionist, that I saw a small straw nest of eggs in a coop. I marveled at the light and texture on the surface of the eggs and sighed. Then I realized Wyeth had rolled his fingerprint on to the wet eggs. This island will always have Allen Whiting's fingerprints on its trees, fields and soul. Thank you for this sketch in time Jenna Shepherd. Allen doesn't mention that for years he was a excellent third baseman in the Island fast pitch softball league. A great story about a special person. Centerfield. He was fast enough to get everything and had a terrific arm. Allen is my favorite painter and I thoroughly enjoyed this article. Allen Whiting is one of the kindest and loveliest people whom I have ever met. When I have visited him in his wonderful gallery/home, not once did he ever hurry me along as someone with a fatter wallet or a more famous face walked through the door. Mollie Doyle surely encountered the very same gentleman when she was lucky enough to spend the day with Allen. I am also fortunate enough to have a few of Allen's works hanging on my walls and not a day passes that I don't stop and gaze at the sky of one particular one and feel blessed. I think he has more than ten "good" years in him! Your article caught the real Allen! I felt like I was there with you... his wife Lynne is my first cousin and I've been fortunate to spend time with them on the farm, on the island, and love him immensely... A true talent and gentle man. Allen and Lynne are not only two of my favorite people on this island, but two of the loveliest, kindest, most interested and interesting people on the planet. I'm deeply grateful to know and love them. I never pass their home without thinking of Allen's heartfelt letter-to-the-editor a few years ago thanking workers for the caring way they removed a dead, beloved tree that had graced his property since he was a boy. What a great read. A day in the life of Allen Whiting is a humbling, exciting, colorful, exhausting and treasured experience. He paints with honor, he loves the earth and is such a good example of a person who learns from everything and everyone around him. I am honored to be surrounded by "A" Whiting's in our home. Our collection goes back far enough that you can see his artistic development over 4 decades. I am a girl from the mountains with paintings of the sea shore throughout my home though my favorites are still the paintings of hay fields and forests straight from the Whiting farm. Thank you for this article, Mollie and the photographs, Jeanna. Another piece of the Vineyard to take me back. William Ross Searle, Mashpee, Ma. This was a great article on Allen Whiting. His sheer honesty, whether it is how he paints, or, how he lives his life, is so admirable. The author got the real Allen Whiting. He grew up with Vineyard soil in his veins and has lived his life, tended his farm, and animals, and his painting with an honesty admired by all. Allen has numerous fellow painters who have copied aspects of his painting style, or, just plain copied him. 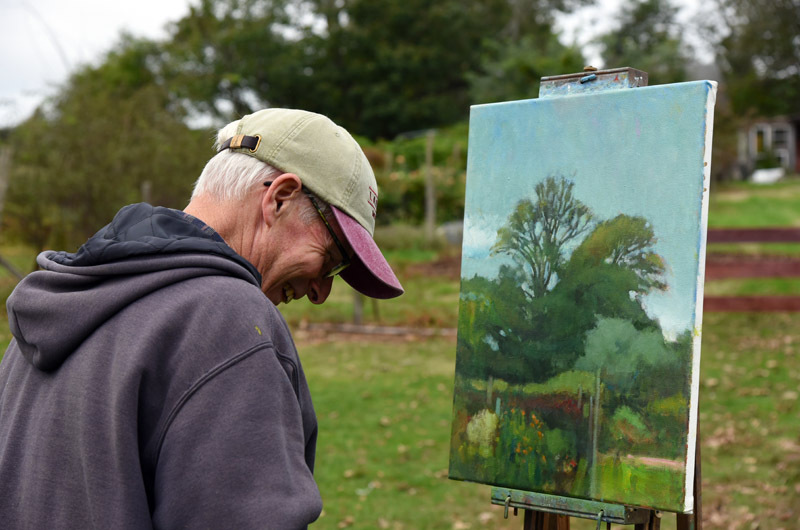 That may be testament to how his paintings and honesty, capture what is most valuable about the Vineyard.